Group Tours: The Museum welcomes school tours, private tour busses, groups of senior citizens, Scout troops, etc. Volunteers generally conduct school tours. Group tours can be self-guided if desired. 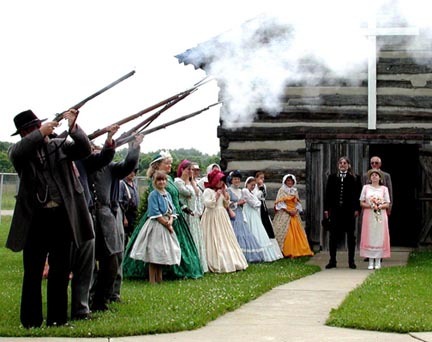 Family Reunions: The Museum is an ideal place for family reunions. It offers plenty of space and activities for younger members while the older ones sit in the shade at one of the two picnic shelters. Parties: Our climate-controlled dining room which will contain up to 200 persons. The dining room is available year round by reservation only. Meals can be catered, or you can bring pot luck. Please call for current rates. Weddings: Weddings and receptions can be accommodated on the grounds. The museum is a perfect setting for an old-fashioned wedding. The log church provides an intimate setting for a small group. Individuals: Normally, individuals take a self-guided tour and view the exhibits at their own pace. NOTE: It is advisable to schedule your trip as early as possible so that the museum can make arrangements for tour guides, if desired. There is ample parking space for tour buses. Teachers may conduct part or all of the tour if they desire. Allow at least two hours for a tour. To check for availability of facilities, e-mail or call 304-675-5737. To avoid any conflicts, all reservations must be made by calling the office. To make a reservation at the museum please call (304) 675-5737. 2. Contact Person: name, telephone and e-mail address. 3. Date and preferred arrival and departure times. 4. Number of people in party. 7. Meals: catered, pot-luck, prepared by our dining room, menu? 9. Do you want a guided or self guided tour? Open Tuesday - Saturday 9 a.m. - 5 p.m., Sundays 1-5 p.m.